The Church celebrates the Feast of St Peter and St Paul on Friday 29 June. 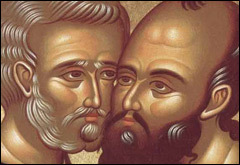 St Peter and St Paul were extraordinary men and role models in the early Christian Church. As leaders in the early Christian community, they were instrumental in shaping the identity of the Christian Church so it was firmly founded on Jesus’ teachings and his ways of doing things.